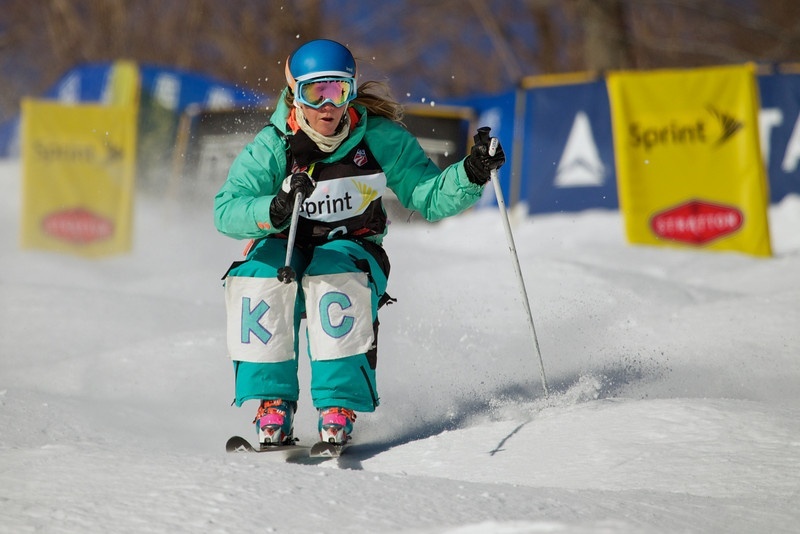 Park City, UT – U.S. Freestyle moguls athlete K.C. Oakley knows what it’s like to fight through pain and injury. And she’s no stranger to the commitment and dedication it takes to be the best in the world. But it was nothing like the fight she watched her best friend endure. And it left her with the passion to fight for a cause to help others. Oakley went about her career a bit differently than most of her teammates. She was a student at U.C. Berkeley where she spent her years traveling back and forth on the competition circuit. While at Berkeley, Oakley met Jill Costello, a 21 year-old coxswain on the crew team. They became best friends. “One of the reasons we were so close is because we understood each other’s athletic lifestyle — the long hours, dedication and passion it took to be a high level athlete. We were each other’s biggest fans,” said Oakley. But one day Costello noticed a lingering pain in her abdomen. After a trip to the ER, and several scary diagnoses later, she was told she was in stage four lung cancer and had nine months to live. As Oakley watched her seemingly healthy friend fight for her life she knew she could not just sit by and watch. Oakley, along with 23 other young professionals who were close to Costello, started “Jill’s Legacy”, a foundation that aims to bring to light the 15.5 percent survival rate of the world’s number one cancer killer. Through educational outlets and various fundraising activities around the country, Oakley and her friends aim to shed light on these scary statistics. Lung cancer has the stigma that those who get it usually bring it upon themselves by unhealthy living. Yet Costello was a healthy 21 year old non-smoking athlete. While other cancers have benefited from modern science and research and exceeded survival rates of 95 percent, the survival rate for lung cancer hasn’t budged from 15.5 percent in 40 years. Costello had told K.C. not to look at the statistics for lung cancer. “Looking back now, if I had known the shockingly low survival statistics of lung cancer during her fight, we may not have been able to act like everything was normal like she wanted us to” said Oakley. After dozens of chemo treatments, Costello returned to her boat where she led the varsity boat to win nationals. Costello and Oakley also returned to being roommates. “It was amazing to watch her smile as she struggled to get out of bed every day. I have never seen such strength and courage from anyone else” said Oakley. One year after Costello was diagnosed with lung cancer, she passed away. Yet her story and ongoing determination to never give up are still ever present in those who knew her as well as those who have heard her story. Oakley along with her rest of the board at Jill’s Legacy visit colleges across the country to promote the “Jog for Jill” 5k races. The race that took place at Berkeley earlier this year raised $98,000. All money raised through the groups fundraising campaigns goes directly to young researchers and lung cancer awareness movements.